Fellowship opportunity in the Endangered Archives Programme – North Africa and Middle East. Damage in Daraa. Copyright The Syria Times. The head of the Antiquities Directorate in the southern Daraa province says that “80% of archaeological sites in the province has [sic] been systematically damaged and looted during the years of war on Syria.” Read more on the Syria Times website here. The Syrian Democratic Forces recently liberated the Raqqa Museum from ISIS, according to the RMC Media Center. Their source pointed out that the organisation used the museum as a military base after they looted and destroyed most of the archaeological finds in it. To see the photos on the DGAM website click here; for more of the museum see here on the ATPA website. Photos on social media shared by Leen Yasmin Rashied show Al-Raqqa Museum after the expulsion of ISIS. The photos show damage to its structure, in addition to the loss of everything inside the museum. The Association for the Rescue of Archaeological Sites in Northern Syria reports on damages and looting at the site of Tell Diniet. To read the report click here. ASOR’s Cultural Heritage Initiatives June 2017 Monthly Report is now available here. The Idlib Museum have started a campaign to return antiquities illicitly trafficked during the past six years. Read the full article on the Anadolu Agency website here. “Aleppo. A Portrait of Absence” features performances based on interviews with inhabitants of Aleppo talking about places of importance to them. Haus der Kulteren der Welt, Berlin. 21 – 23 September 2017. More information and tickets available on the HKW website here. At Australia’s only Assyrian school, refugee children learn about both their Syrian heritage and Australian culture. Read the ABC article online here. The Directorate General of Antiquities and Museums is holding a two-day workshop to explore the conditions of Syrian heritage sites and plans for post-crisis reconstruction. Read more on the Syria Times website here, and on the DGAM website in English and Arabic. Al-Monitor reports on the destruction of Syria’s mosaics and the challenges facing modern mosaic makers. The archaeological sites in the middle Euphrates valley have been documented in a post (8/5/ 2017) from ATPA (PDF here). They documented some archaeological sites recently liberated by Syrian Democratic forces here. There is also a report about archaeological sites in Al Hol area by ATPA here. Tell Badiri ,Tell Taban, and Tell Teninir have also been documented here. The DGAM, represented by Dr. Maamoun Abdulkarim, Director-General, participated in the Blue Shield Conference at Vienna Rathaus (Town Hall) in Austria between 14 and 15 September. An international meeting on de-escalation in Syria will take place in Astana, Kazakhstan, 14 – 15 September 2017. The talks are expected to include a joint statement on the humanitarian demining of historical monuments in Syria included in the UNESCO World Heritage list. Read more on the Trend news agency website. This fellowship opportunity is within the Endangered Archives Programme (EAP), co-ordinated and hosted by the British Library. Supported by the Arcadia foundation, the EAP has a mission to protect through preservation, social and cultural archival material that is in danger of destruction, neglect or physical deterioration worldwide. Available in the following countries: Algeria, Egypt, Israel, Jordan, Lebanon, LIBYA, Mauritania, Morocco, Palestine, South Sudan, Sudan, Syria, Tunisia. The International Federation of Library Associations and Institutions has published a new guide to its work preserving cultural heritage. Download the guide in English, French, Spanish, German, Russian, Chinese and Arabic on the IFLA website here. ASOR has provided a link to “Six Palmyrene Portraits Destroyed in Manbij, Syria: A Salvage Reading.” Abstract: Operatives of the Islamic State reportedly destroyed six Palmyrene funerary busts and statue fragments in Manbij, Syria, on July 2, 2015. This article considers the ethical implications of publishing photographs of antiquities that have been destroyed, arguing that in such dramatic cases as destruction, it is justified to publish readings. Photographs of these antiquities are then analyzed, their physical and iconographic characteristics described, and readings for three of the inscriptions suggested. Finally, the loss of data caused by the items’ destruction is measured against the loss of data occasioned by looting. Read the article online here, Free access until Sept. 22. Issam Kourbaj – whose work is currently featured in the Penn Museum exhibition “Cultures in the Crossfire: Stories from Syria and Iraq” – will be holding a special event at the Penn Museum. Free Event Sunday, September 17, 11:00 am to 5:00 pm (Drop-in Workshop); 5:00 to 6:00 pm (Performance by Artist). Read more on the Art Fix Daily website here. Dr. Eleanor King from Howard University will present on trafficking in illicit antiquities and how it relates to other crimes. Bowdoin College, 20 September 2017 at 7 p.m. Details on the Bowdoin website. Apollo Magazine writes about the current condition of Aleppo, plus the challenges and opportunities of reconstruction for a city so rich in heritage. The New India Express reports on Russian promises to assist with reconstruction efforts in Syria by sending construction and building materials. 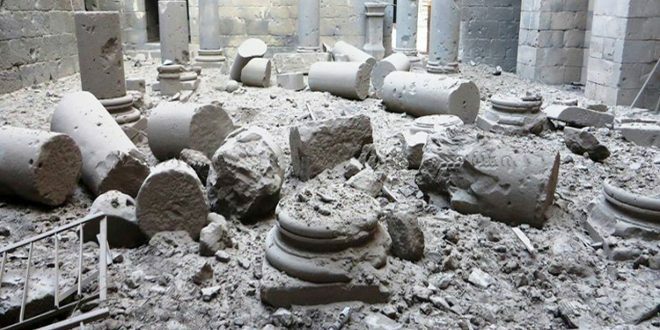 The Gulf News publishes an opinion piece on the damage to cultural artifacts and monuments in Syria and beyond. The Spec reports on a meal delivery service in the US that hires refugees to prepare dishes following their culinary traditions.